who crossed Whitcombe Pass with Julius von Haast and Andreas Reischek in 1879. Head for the small permanent ice gully south-west of Mt Neave. Continue to the col and then up very loose rock. The first ascentionists followed Snag Creek, climbing out on the true left, then climbed the South Ridge and descended the West Ridge. However, it needs to be noted that maps at this time all placed Snag Creek downstream of Neave Creek, while the metric series place Snag Creek upstream. Their Snag Creek was probably today’s Neave Creek. From the Whitcombe Valley, reasonable tussock access to the gravel basins under the Main Divide exists around Cap Creek and Molar Stream. From the permanent ice at the head of Neave Creek, pick a line through bluffs (crux) to reach the West Ridge between 2000 and 2100 metres. Other routes onto the ridge from lower down should also work and may be easier. 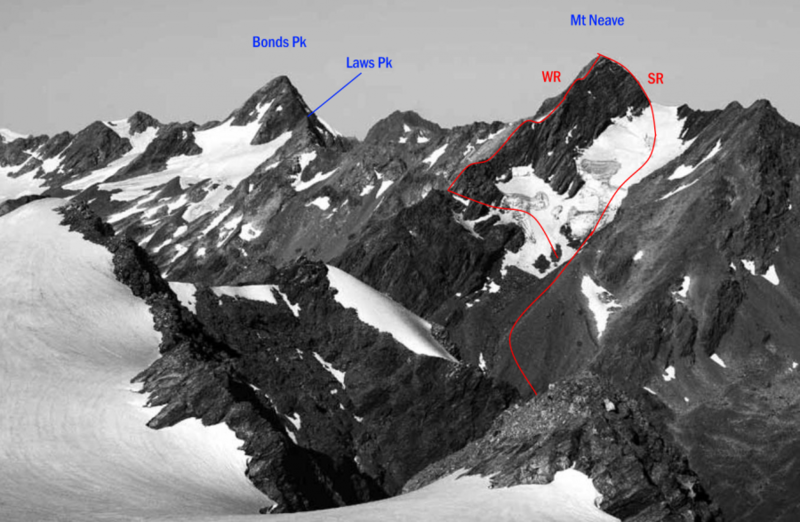 The original party bashed up through bush from Cave Camp and, forsaking the ridge, headed straight up the face on steep snow and good rock, belaying part of the way. The last part was over tumbled scree.